Blood is the bodily fluid responsible for transport of materials and waste products throughout the body. It carries oxygen from and carbon dioxide to the lungs, nutrients from the digestive system or storage sites to tissues that require them, and waste products from the tissues to the liver for detoxification and to the kidneys for disposal. Blood delivers hormones to their sites of action and circulates numerous critical parts of the immune system throughout the body. Blood regulates its own pH , as well as that of the intercellular fluid in the body, and aids in thermoregulation by redistributing heat. Blood also carries the proteins and other factors it needs to clot, thereby preventing its own loss in the event of injury to the vessels in which it travels. Erythrocytes (red blood cells) are very small cells, usually with no nucleus or internal membranes, and are stuffed full of the oxygen-binding protein hemoglobin. A human adult has 4 to 6 liters (1 to 1.5 gallons) of blood, approximately 92 percent of which is water. 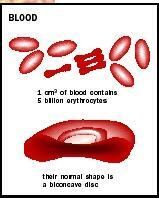 Nearly half its volume is red blood cells (RBCs, or erythrocytes). Proteins, sugars, salts, white blood cells, and platelets make up the remainder. The noncellular portion is termed plasma, while the cellular parts are collectively referred to as the formed elements. Blood forms in the bone marrow, a spongy tissue contained in the bones. Only a small amount of the oxygen needed for life can dissolve directly in plasma. Oxygen transport instead relies on red blood cells. At any one time, there are more than 25 trillion RBCs in circulation in an adult, more than the combined total of all other cell types in the body. As RBCs develop, they extrude their cell nucleus , so that at maturity they have almost nothing inside their membranes except the oxygen-carrying protein, hemoglobin . The absence of a nucleus contributes to the RBC's short life, as does the constant physical stress it experiences squeezing through capillaries that are narrower than it is. The average RBC circulates for approximately 120 days before being destroyed in the liver, bone marrow, or spleen. The iron from hemoglobin is recycled, while the cyclic nitrogen compound that holds it, called heme, is converted to bilirubin. Bilirubin is transported to the liver for elimination from the body as bile. Liver disease can cause jaundice, a yellowing of the skin due to bilirubin in the blood. The iron in hemoglobin is critical for oxygen transport. Lack of dietary iron is one cause of anemia, a condition in which the blood cannot carry enough oxygen. The heme group binds oxygen tightly when the concentration of O 2 is high (as it is in the lungs), but quickly releases it when the concentration is low, as it is in the tissues. The iron can also bind carbon monoxide (CO), which is produced by car engines and other combustion sources. CO binds much more tightly than oxygen does and prevents oxygen binding, making CO a deadly poison. A genetic variant of the hemoglobin gene causes a single amino acid change in the hemoglobin molecule. This change causes the red blood cell to become sickle-shaped at low oxygen concentrations, so that it tends to become lodged in small capillaries, depriving tissues of oxygen. A person with one such variant hemoglobin gene does not suffer ill effects, but with two variants will develop sickle-cell anemia. Despite this, the sickling variant is common in populations historically exposed to malaria, because having one variant helps protect against malaria infection. Carbon dioxide (CO 2 ) does not bind to iron, but rather to the protein portion of hemoglobin. CO 2 is a product of cell respiration, and is picked up in the tissues and transported to the lungs. Most of the CO 2 transported is actually in the form of bicarbonate ion , HCO 3 - . Bicarbonate is formed by the enzyme carbonic anhydrase, which is present in the red blood cells. This enzyme catalyzes the conversion of CO 2 and H 2 O to carbonic acid (H 2 CO 3 ), which immediately splits to form H and HCO 3 - . Besides serving as a transport form of CO 2 , HCO 3 - also participates in blood buffering. It can react with excess H (acid ion) formed in other reactions. In this way, it prevents excess acidity in the blood. Similarly, HCO 3 - can react with excess OH - (base ion) to form water and CO 3 2- , absorbing excess base. Along with phosphate, bicarbonate keeps the blood buffered at a pH of 7.4. Blood also transports nutrients, hormones, and immune system components. Nutrients from the gut are dissolved directly in the plasma for transport, but are quickly shuttled to the liver for processing and storage of excess. Insulin and glucagon, hormones produced by the pancreas, control the level of blood sugar by promoting storage or release of glucose . The kidney performs the vital function of excreting excess salts and water, as well as metabolic wastes, helping to maintain blood levels of these substances within narrow limits. One waste product the kidneys cannot excrete is heat, produced by cell metabolism through out the body. Blood performs the vital function of carrying heat from the body core to the periphery, where it can be cooled before returning. Hormones are released by endocrine organs directly into the bloodstream for wide and rapid circulation. White blood cells also use the circulatory system as a highway through the body, traveling in the blood until they exit in response to chemical signals from wounded or infected tissues. Platelets and clotting proteins in the blood work together to prevent blood loss when a vessel is broken. Clotting relies on chemical signals from damaged tissue and from platelets, and the activation of a complex cascade of more than a dozen different plasma proteins. Guyton, Arthur C., and John E. Hall. Textbook of Medical Physiology, 10th ed. Philadelphia, PA: W. B. Saunders, Co., 2000. Stiene-Martin, E. Anne, Cheryl A. Lotspeich-Steininger, and John A. Koepke. Clinical Hematology: Principles, Procedures, Correlations, 2nd ed. Philadelphia, PA: Lippincott Williams & Wilkins, 1998. African-American surgeon who invented a way to preserve blood plasma so that it could be stored. Drew's plasma saved the lives of thousands of Londoners during the Nazi bombings in World War II. But when the U.S. military refused to accept blood donated by black Americans, Drew resigned from his post as head of the Red Cross's "Plasma for Britain" program.